This series deals with the investigation of Alabama’s numerous treasure legends. As time permits we will begin research on the legends listed below. This list will be modified as our investigation proceeds. Near Athens, Alabama there may be a Confederate treasure. Long standing legend tells of $100,000 of gold and silver was put into two boxes by Confederate troops in 1865, and then thrown into the swamp. The troops were trying to keep the gold and silver away from Union soldiers. Stories often differ as to container, metal or wood, and location. Another version states that two wooden crates, each 2’x3’x4′ and filled with a large amount of gold and silver coins said to total $100,000 and destined for the Confederate forces at Columbia, Tennessee, were buried when Union forces approached as the wagon transporting the huge treasure became mired in a bog-hole near Athens. The cache was made at an 1865-era stream crossing about 4 miles north of Athens, Alabama and about 1/2 mile west of the crossing. In the 1830s, when the Cherokee Indians were forced to leave their lands and move to Oklahoma, a pot of gold was buried on the old Shelby Cullom farm, two miles north of Ryland, Alabama, in eastern Madison County, Alabama, in a place called Bellfaun which borders the Flint River. Some tales list this as “Old Flint River Settlement” and some say Bellfaun was a farm owned by a man named Shelby Collum. $30,000 in gold coins, known as the Hickson Treasure, is buried in the Bridgeport, Alabama area. Buzzard Roost, Alabama is located three miles west of Cherokee, Alabama, in Colbert County, on U.S. Route 72. Bernard Romans‘ Map of 1772 indicated a place called “Chickianooe”, which appears to be a misprint of the Choctaw word “Chickianoce,” “Skeki anusi” or “anosi,” “meaning Buzzards there sleep.”Levi Colbert, Chickasaw Bench Chief, built his stand in Buzzard Roost in 1801, and he ran an inn with his family. He is credited with changing the name from Buzzard Sleep to Buzzard Roost. In the early 1800s, Levi Colbert lived in a house near the ferry he operated on the Tennessee River which became known as ” Buzzard Roost”. It is located in Colbert County, Alabama, just off the Natchez Trace Parkway, the second exit after crossing the Tennessee River heading south. Legend tells of a considerable amount of gold & silver coins is buried in the woods east of the house. White Bluff, also known as Ecor Blanc, is a historic site located along the Tombigbee River in Demopolis, Alabama, Marengo County. It is a chalk cliff, roughly one mile long, that is composed of a geological layer known as the Demopolis Chalk Formation. The upper portions of the cliff stood almost 80 feet above the river before the construction of the Demopolis Lock and Dam downriver. It now averages about 30 feet above the river. White Bluff was first named Ecor Blanc by 18th century French explorers and map makers. It also became known as the Chickasaw Gallery because early Native American inhabitants harassed boats from here.. It was the site where French Bonapartist refugees landed in 1817 and established their Vine and Olive Colony. There are rumors of treasure buried in the area of White Bluff. Jefferson was founded in 1810, before Marengo was a county or Alabama was a state. Most of the original settlers were veterans of the American Revolution, including John Sample, John Gilmore, and Reuben Hildreth. The village was named Jefferson in 1820, after Thomas Jefferson, and that year saw the first church established. The population had reached 200 people by 1860 and the village contained two dry goods stores, one drugstore, a male and a female academy, a Masonic Lodge, a hotel, two tanneries, a wagon shop, and a blacksmith shop. During the Civil War, C. Boaz Whitfield buried a large hoard of gold coins on his farm near Demopolis for safekeeping. The plantation was located 18 miles from Demopolis near Jefferson. He left information to this treasure among his papers, but after his death, the coins went unrecovered. In 1926, a descendant came across the papers and started a search on the Shady Grove farm, looking for an old boundary stake. Using the information, he found a hoard of $200,000 in $20 gold pieces dated 1850 or earlier which Boaz had buried to prevent seizure by Union troops. There is speculation that additional cache remain hidden on the property. Louina, sometimes Ole Louina, is a ghost town located 14 miles west of Roanoke and about one mile east of Wadley in Randolph County. Ole Louina was a community during early settlement of Randolph County which was settled after the Battle of Horseshoe Bend in 1814 when the Creek Indians were defeated by General Andrew Jackson. Louina was an important town in Randolph Co.
Louina was named for a wealthy Indian Woman. When she was forced to leave, it was said she put her silver in sacks but they were so heavy, the ponies could not carry the load. Legend said Louina buried some silver but, despite years of digging, none has been found. The town was founded in 1834 and lasted until about 1905, and at one time was largest town in Randolph County with two churches, 30 homes, eight stores, two schools (one for boys and one for girls), hotels, taverns, saloons, a gristmill, a Masonic Lodge and a Methodist and Baptist Church. The Randolph County Historical Society has placed a marker at the entrance to the town telling the history of the ghost town. About six miles northwest of Florence, Alabama, on the White’s Mill Road, stands the historic White’s Mill. For many years, this mill ground corn and flour and provided people in the community with jobs.In 1897, a man by the name of C. E. Sharps bought the mill. Eventually, he became quite wealthy. He was fond of gold and insisted that most payments be made to him in gold coins. The old mill still stands, and the wood still lies to the south of it. With a good metal detector and a few days’ time, a treasure hunter might be able to find C. E. Sharps’ cache or caches of gold coins. This story comes from Daily Odds and Ends. Long standing tales say that the pirate Jean Lafitte made mysterious visits to the vicinity of Fort Morgan, Alabama, during his many years as a pirate. Historians believe that he may have buried some of his $10,000,000 treasure here at Fort Morgan. From 1815-1864, Henry Nunez operated a very profitable ferry on Perdido River, about where Hwy 90 now crosses the river, about 16 miles N.W. of Pensacola, Florida on the Alabama side; near Seminole, Alabama. He died around 1866 and it was believed by area residents that over $100,000 in gold and silver coins was never recovered. The hoard is presumed to be in several different caches and buried somewhere near the ferry landing or the ruins of his old house. Morris Slater, alias Railroad Bill, was a train robber in the 1890s in southwest Alabama. A former circus hand and turpentine worker, lived life on the edge, becoming legendary as Railroad Bill, the most celebrated African American desperado in history. None of the loot he acquired over his 6 years of banditry was ever recovered. Many believe the cash was buried, possibly in a cave. The only clue he left behind, before he was gunned down at Atmore, Alabama in 1896, was that he never strayed far from the railroad tracks between Atmore, Alabama and Bay Minette, Alabama. In December of 1864 word was received by townsfolk that Colonel Joseph Sanders was on his way to Newton, Alabama with his horde of deserters, escaped slaves and common outlaws to attack the town. Plans to defend the town were quickly completed and a box filled with gold coins in the courthouse was buried by 3 men somewhere nearby. After the attack was over, the 3 men who hid the box were dead and the location of the cache died with them. It was never recovered. The McGillivray Plantation ruins can be found 4 miles north of Wetumpka, Alabama. Built around 1750, it was destroyed during an Indian attack sometime later. There are legends that a hoard of coins and silver tableware remains buried or hidden on the property. The McGillivray Plantation known as “Little Talase” and “The Apple Grove” – 1740 – 1793. Here lived Lachlan McGillivray, Scotch trader among the Indians. His wife was Sehoy, of the Creek tribe of the Wind. John Willsmith owned nearly half the town of Fort Payne in the late 1800’s. After his death in 1898, searchers were made to find the $100,000 in gold he was known to have accumulated, but all failed. It is believed to remain buried on one of many pieces of property Willsmith owned in the area. In the 1800’s the outlaw Jesse James used the area of Dawson, Alabama for a hideout, located on Sand Mountain not far from Collinsville, Alabama in Dekalb and Cherokee Counties. Collinsville is located in the Little Wills Valley, between Lookout Mountain to the east and the smaller Big Ridge to the west.There are those who speculated that Jesse James cached some of his outlaw treasure somewhere in the area that never was recovered. Around 1832, Indians had a secret source of silver somewhere near their village which was located near Ironaton, Alabama. The location was believed to be to the northwest of the village in the area of Wolf Creek. When the tribe was forced to a reservation in Arkansas, they took with them only a small portion of the silver they had mined. The larger portion is believed to have been buried in or near the mine. To get to the area of the mine, proceed east from Birmingham on Interstate 20 approximately 25 miles to the Pell City exit. Take the Pell City exit one mile to U. S. 78, which crosses Wolf Creek. This is in the general area where Stone’s pursuit of the Indians ended. Tallassee, Alabama is located in both Elmore and Tallapoosa counties. At the 2010 census the population was 4,819.The Horseshoe Bend Treasure, $200,000 in gold coins, is buried near Tallassee. 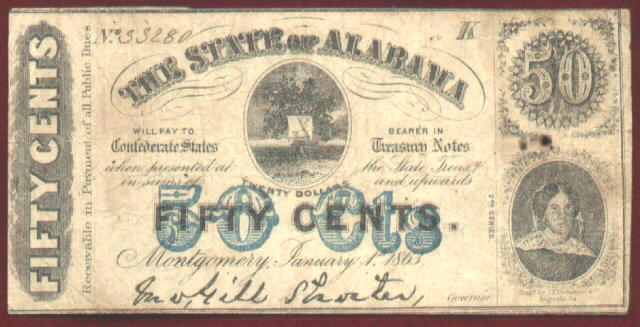 During the Civil War, 3 wagonloads of gold and silver coins worth $285,000 were buried along a fence line near Tallassee in the central part of the state. The treasure has never been recovered. In June 1864 the Confederate army moved the Richmond Carbine Factory from Virginia to an old Tallassee cotton mill. It began manufacturing the carbines. During the course of the American Civil War, the town of Tallassee was never attacked by Union forces, except for their one attempt to destroy the Tallassee Mill. The Tallassee Armory was the only Confederate one not destroyed during the war. In 1903, an Indian came to Roanoke, Alabama from Oklahoma and inquired about some old mulberry trees in the area. Old residents told him where one was located, but the others had been cut down. Near the standing tree, the Indian dug up a large number of Indian relics but his deerskin waybill was useless for the other caches, believed to contain vast quanities of gold Indian treasure. There were occasionally incidents with Native Americans. Roanoke was originally called High Pine when it was settled in the early 1830s. The natives burned the entire town to the ground during the Creek uprising in 1836. For a short period of time, the name was changed to Chulafinnee, but soon afterward changed to Roanoke. The town was incorporated by an Act of Legislature on Dec. 13, 1900. The outlaw James Copeland buried a barrel of gold coins worth an estimated $350,000 near the Pirate Oak in Bayou La Batre. There are no reports of any recovery of this cache. The pirate Jean Lafitte is said to have buried $80,000 in gold coins on a beach in Bayou La Batre S of Mobile. The Gulf Coast pirate Gasparilla reportly buried several cheasts of pirate loot at various locations in Mobile Bay. Dauphin Island is located across the Mississppi Sound at the entrance of Mobile Bay. It was used by the Spanish, French and the British as an army base and Union troops were stationed here after the Civil War. It was also a haven for early-day pirates and outlaws as well. The island holds many legends of hidden treasure and is a relic hunter’s paradise. A large jeweled cross was dropped in a well on Dauphin island to prevent its being stolen by pirates and was never recovered. Tales and legends of buried jars, pots and chests filled with treasure and savings are circulated quietly among the residents of Dauphin Island that date back centuries. The island has never had a bank. An unidentified Spanish galleon, carrying an estimated $1 million in gold and silver treasure, was caught in a storm and wrecked on the E end of Dauphin Island in 1801. Only 11 crew members survived and told of the rich cargo that was lost. There was no salvage reported. Aberchoochee Arbachoochee Cleburne ALSouth 25 Misc. This is an abandoned town. Old Cahaba Selma Dallas ALSouth 25 Misc. This is an abandoned town. McGillivray Plantation Wetumpka Elmore ALSouth 10 Misc.